This is a top-quality loaf cake without butter, lactose and milk derivates: it is replaced with Agrumato olive oil. Because of these reasons, Pan'agrumato is highly digestive and has a low cholesterol content. Pan'Agrumato with Lemon is realized substituting the butter with the Agrumato Extra Virgin Oils. This is a very original dessert, delicious and soft with an inimitable taste. 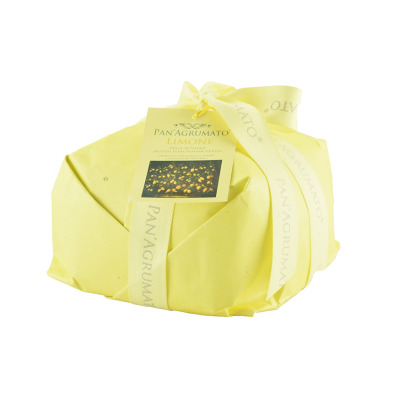 The fragrances of the citrus fruits, the oil and of the raisins create a top quality Christmas cake. WHEAT flour, raisins, EGGS, natural yeast (WHEAT), LEMON PEELS "SICILY"CANDIED 10,50%, (Lemon peels, glucose- fructose syrup, sugar. Lemon juice concentrate. ), extra virgin olive oil Agrumato with Lemon 8%, sugar, lemon paste 4%, EGG yolk, emulsifiers: mono and diglycerides of fatty acids of vegetable origin, OAT fiber, salt, natural flavourings. DOES NOT CONTAIN PALM OIL. ALLERGENIC ADDITIVES - CONTAINS: wheat flour (gluten), natural yeast (gluten), egg yolk (eggs), eggs, oat fiber (gluten), May contain traces of ALMONDS, HAZELNUTS, PISTACHIOS and SOYA.